• seekers (e.g. small and medium-sized enterprises, public authorities etc.) will test co-creation and open innovation methods and will benefit from the exchange with young innovators. Besides, their employees – involved as mentors in the lab - will improve their business competences responding to market requirements and developing skills for future job needs. The results from the pilots will serve to define a transnational strategy to boost innovation and entrepreneurship in the Danube region that will be declined in regional actions plan. 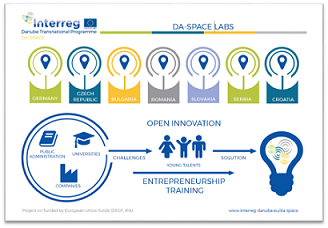 All knowledge acquired in DA-SPACE will be transferred to up to 4 further Danube regions through transferability workshops. The consortium will also define a sustainability strategy to finance the lab after the end of funding, taking into consideration public-private-partnership, sponsorship or national/European funds.